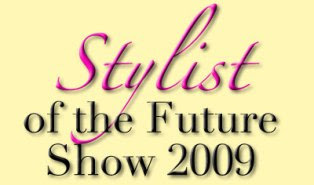 Last night I was out with the girls at the 'Stylist of the Future' hairdressing award show in Nottingham. We had a great time, but what made it even better ......... the winner was my daughter's friend and her model was my daughter! 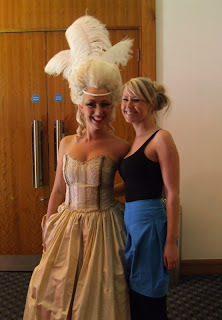 Here is the winning team ... the gorgeous girls; Liz (Marie Antoinette) and Sarah. The majority of the hair was Liz's own, with a few extensions (and a lump of Oasis foam!) She wasn't looking forward to it all being combed out later....ouch! She really looks the part - well done to model and stylist. 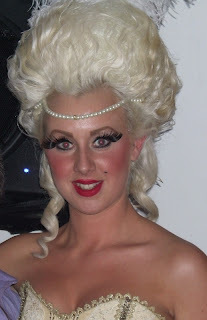 My eldest daughter is a hairdresser and I can remember her taking part in a similar thing while she was still at college. Hope your daughter's hair is now resting comfortably in it's usual style, but we all have to suffer for our art!! Beautiful daughter and wonderful hairstylist a combination of both well done for their win. You are allowed to celebrate with that extra bit of wine after all you are the proud mother. Wow your daughter looks sooooo beautiful. What a wonderful hair. Congratulations to all. I´m so happy for you. how could you not be inspired by your beautiful and stunning "Marie"
Thank you for sharing these photos Linda, what a magical night it must have been! Stunningly beautiful. Of course they would be winners. How wonderful and fun. How fun! Liz is a beauty! What a proud moment that must have been for all of you! p.s. your pkge of goodies arrived yesterday (I have it posted on my blog) Your inchies are amazing - I'm enjoying a cup of the Blackcurrant tea right now - all the embellies are fabulous - and I'm just blown away by the lace you made!!! My pkge will be going out to you today or tomorrow - cheers!....and Thank You! What a fun evening, Linda! Liz makes a lovely model; next you'll have to share an everyday photo. Congrats to her and you, the proud mama. How Wonderful, what clever girls. Liz is very beautiful, you must be very proud. I hope by now its been combed out and it didnt cause too much trouble getting it back to normal hehehe.